Converts images to PNG format. Is there a better alternative to dPNG? Is dPNG really the best app in Image Editing category? Will dPNG work good on macOS 10.13.4? 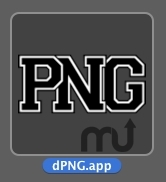 dPNG lets you convert images to PNG format by dropping them onto the application. Also, compress ('optimize') existing PNG files. Uses components from ImageMagick and optipng. dPNG needs a review. Be the first to review this app and get the discussion started! dPNG needs a rating. Be the first to rate this app and get the discussion started!